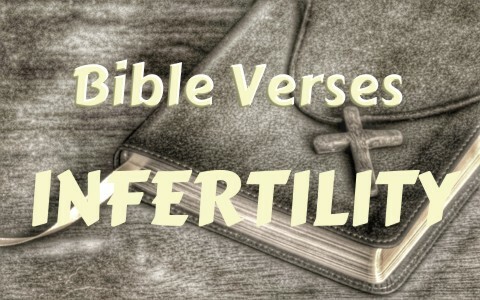 Struggling with infertility might be one of the most difficult trials for a couple to go through so what 7 Bible verses can possibly comfort a couple going through this? I know this is not a promise for anyone wanting to conceive but it does show that it is the Lord that can open the womb. I can’t think of anything that would be harder for a couple to go through than to not be able to conceive children. There are so many like Hannah who begged God for a child, Sarah who had long ago given up, and John the Baptist’s mother, Elizabeth, who like Sarah, was older and had probably given up on having children. What is more difficult than being older in age and at the age of most grandmothers than to finally have a child? Sarah had likely given up on ever having a child and so talked Abraham into having a child through Hagar and wouldn’t you know it, Sarah would later have her own child and her jealousy drove Hagar and her child Ishmael away but “By faith Sarah herself received power to conceive, even when she was past the age, since she considered him faithful who had promised” (Heb 11:11). If you read Psalm 37 it’s all about delighting in the Lord and when a couple delights in the Lord He may grant them their greatest desire as it says “Delight yourself in the Lord, and he will give you the desires of your heart” (Psalm 37:4). To delight in the Lord means that we take great pleasure in living lives of obedience to God and that we delight in doing what He says in His Word. This is not a promise to give us every desire we would ever have but it is a promise that God grants us the deepest desires of our heart when our delight is in Him. To delight in the Lord does not mean delighting in things that we want over what He wants. The Hebrew word used for “heritage” is “nachalah” and means a “possession, portion,” or “inheritance” so children are basically a gift from God and a possession He gives to us. The “fruit of the womb” is “a reward,” perhaps from living a life of obedience to Him. Nowhere is this seen as a promise of receiving a child for living a life of obedience but it simply says that God is the giver and the “Author of life” (Acts 3:15). When we focus on the present, we sometimes take our eyes off of our eternal rewards in the kingdom. We live today for things in the future. When Christ comes for us someday, we will look back and think about what this life was like and the glory that we will behold in that day will be nothing to be compared to what we had to go through in this life (Rom 8:18). It seems that the Bible is full of couples who were struggling with barrenness. Isaac’s wife Rebekah was no exception and all that they could do was to pray to God for a child and when “Isaac prayed to the LORD on behalf of his wife” the “Lord answered his prayer” and “Rebekah became pregnant.” There is always hope and it may be that God wants us to seek Him desperately enough in prayer for children before He will answer our prayers. Sometimes the answer is no, sometimes the answer is not yet, but we know that God does hear our prayers because “the eyes of the LORD are on the righteous, and his ears are attentive to their cry” (Psalm 34:15). This was God doing the impossible and testimony from the Word of God that with God, nothing is impossible. I know of some couples who struggled mightily with not being able to conceive. It was not their lack of faith but it was all about God’s timing. God is the One Who weaves life inside the womb as Psalm 139:13 says “For you formed my inward parts; you knitted me together in my mother’s womb” and sometimes we just have to wait. God’s delay is not always to be taken as God’s final answer. If you have or are currently struggling with infertility, God declares of the future coming kingdom “Sing, O barren one, who did not bear; break forth into singing and cry aloud, you who have not been in labor! For the children of the desolate one will be more than the children of her who is married,” says the Lord. “Enlarge the place of your tent, and let the curtains of your habitations be stretched out; do not hold back; lengthen your cords and strengthen your stakes. For you will spread abroad to the right and to the left, and your offspring will possess the nations and will people the desolate cities” (Isaiah 54:1-3). If you haven’t been able to conceive yet, perhaps it’s God telling you to adopt because there are so very many children who are waiting to be adopted. For those who have been childless for many years and have adopted children, their heartbreak has finally been replaced with a joy inexpressible because a parent is not just one who has given birth, parents are ones who have taken the orphaned of the world and have become loving, godly parents of children who had no one else. I’m still looking for a good Christian response to infertility and I’m sorry to say I don’t think this article hits the nail on the head. Adoption is yet again pedalled as a solution, but it’s not as easy as that! There is nowhere in the Bible God instructed any waiting to have children to Adopt. There is nothing wrong with Adoption but adoption is not the solution to infertility. Faith , patience and listening to the holy spirit for guidance is the solution. Remember God didn’t speak to Abraham for 13years after he got impatient and got his Maid Hagar pregnant. The scriptures are real any couple struggling with infertility should look out for Divine Instructions from the Holy Spirit. It may take some time but it will surely come. Next post: Why Did Jesus Say On The Cross That God Had Forsaken Him?